Three years after she took the women’s individual time trial title in the Worlds in Salzberg, 2008 Olympic champion Kristin Armstrong was back on the top step of the podium of the same event celebrating another gold medal win. 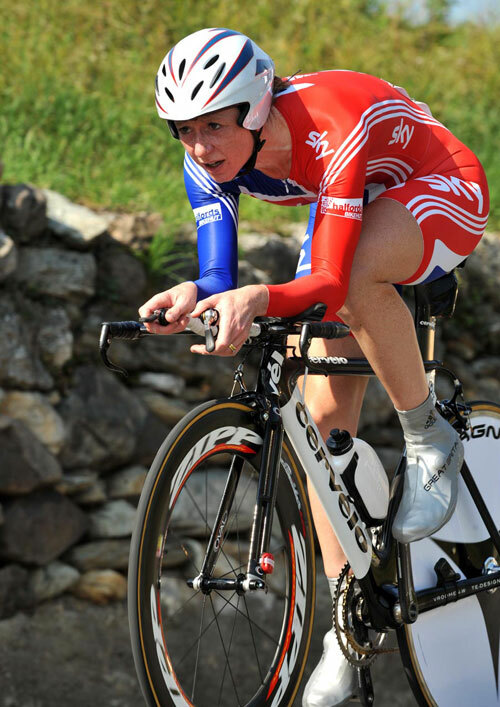 Britain’s Emma Pooley finished 11th. The winner of the Beijing Olympics time trial, Armstrong turned in a devastatingly powerful ride on Mendrisio’s rolling course. In just 26 kilometres racing, the American finished a staggering 55 seconds clear of second-placed Neomi Cantele. Denmark’s Linda Villumsen completed the podium for bronze. From the moment Armstrong reached the mid-race checkpoitn 23 seconds clear of Cantele it was clear the Idaho-born pro was heading for gold barring accident or disaster. In fact, she more than doubled that margin in the second half of the course, storming to her second individual tt title in four years. The winner of the 2008 Olympic title, Armstrong admitted afterwards that taking fifth in last year’s World Championships was disappointing. Britain’s Emma Pooley turned in a below-expectations ride to finish 11th at 1-57. Eighth at the half-way point, the Londoner lost even more time in the second half of the course.